When some shows go on tour, they pack costumes and props. The Royal Shakespeare Company shlepped a whole stage. 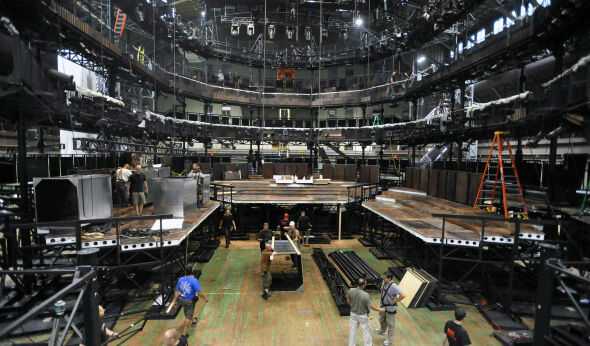 For a six-week residency at the Park Avenue Armory, the world’s most famous Shakespeare troupe is performing on a full-scale replica of their theater in Stratford-Upon-Avon, England. SundayArts followed the story as the stage took shape in the Armory’s 55,000-square-foot Wade Thompson Drill Hall. The Royal Shakespeare Company is an ensemble, and the actors trade roles in the Shakespearian repertoire. The company is performing “Julius Caesar,” “As You Like It,” “Romeo and Juliet,” “King Lear” and “The Winter’s Tale” throughout the summer.